In design we talk about identities. A corporate identity for a company, a product identity for a logo. One crucial thing, though: a brand is not a logo. A logo can be a part of a brand. In fact, the logo or marque is a subset of the identity, and the identity, the visual manifestation, is a subset of the brand. A brand is collection of feelings that you have about a product or company. As such it’s a function of all of your senses, not just the visual, over time. Branding involves thinking about personas, personalities, emotions, loyalties, hopes and fears. An identity is the visual entity representing your product or company. It might be a logo, which could be the name plus some graphical element, and perhaps a strapline, reproduced consistently as a collection of elements using the right colours, typefaces, sizes and white space surrounds. Like a brand, it has goodwill embedded in it, both emotionally in terms of how we feel about it and financially as a valuable balance sheet item. A logo can be worth a fortune, like the Coca Cola name in the cursive script and the flourishes. But a logo is a like a city, whereas a brand is like a nation. I’m rather enjoying this trip down memory lane, revisiting some of the interesting things I remember from my graphic design days, though I was always more of a ‘suit’ than a ‘roll neck’. I hope you are too, because I’m about to continue in this vein. One of the great things about typography is the detail. We take the printed word and fonts for granted, so much so that we forget that someone very gifted actually invented each of them, drawing each letter out, labouring over every contour and fighting for them to get popular so that printers would design the blocks to print stuff using them. One such someone was Eric Gill, a superb artist and – as it has emerged many years after his death – a complex, pretty disturbed individual. He did, however, give his talents and his name to one of the most recognisable typefaces around. 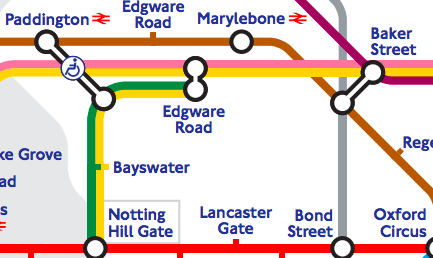 You see, the eponymous Gill Sans typeface is the one used to this day on the London Underground, an infrastructure and system so brilliantly signposted and easy to follow that you’re only reminded of this when you try and navigate the systems of other world cities. It was also adopted by many of the UK regional railway bodies and graced advertising posters up and down the country for generations. A long time ago, I wrote a corporate brochure using the Leitmotif of ‘renowned art’. As well as a Henry Moore statue, the Chrysler Building and a few others, I also featured Mr Gill and his Gill Sans typeface. Worthy company for an inspirational typeface I think. Speak of graphic design, there are some handy words from the world of typography that are good to know if you are in any way responsible for marketing end products like websites or brochures. Design used to be this black art that creative types used to jealously guard like masons. Now, with the advent of technology, everyone can turn their hand to design and everyone in turn can contribute to the creative process. First, the typeface. Typeface means the same as font as far as I’m concerned. The typeface is the generic family of font style used for letters. For example, Arial is a typeface and you can have variations of it, like bold, italic, and so on. OK, that was easy. Next, we have pointsize, or more accurately, point size. Otherwise known as – yes, you’ve guessed it – font size, the pointsize is the size of the typeface measured in the number of points high, a point being kind of a full stop. So, standard document lettering might be Arial regular, 12-point, for example. When you get a bunch of letters forming a paragraph, then you have more choice around how you present those letters, for visual attractiveness or readability. For example, how close together should the letters be together, horizontally or vertically? The leading is the distance between the lines, or more accurately the between the bottoms of the lines. It has the similar effect to the ‘line spacing’ in Microsoft® Word, so the greater your leading, the more white space between your lines and the more readable and less dense it it. The word is pronouncing ‘ledding’ and harks back to the heavily metallic engineering days of printing. A designer is able to adjust the leading by minute amounts using design software, which can often buy an extra line on a page to help with layout. Finally, and most obscurely in today’s post, we have kerning. Kerning is the spacing between the letters. Again, this allows the designer to cheat slightly by adjusting the kerning in a few words to avoid unsightly widows or orphans. Graphic design is the art of making stuff look good with images, text and the use of the areas around the images and text, ie nothing. I worked for a number of years in a marketing and design agency and acquired a considerable respect for the craft of the designer. I am a writer. The text part is my thing. I am not a designer and I will always defer to a designer to concentrate on what they do best, which is the presentation of my content. I also have a degree of awareness about design, so there are a few things I’d like to share with you that will go some way to making the text look better in your important documents like collateral and proposals, without necessarily changing the content. First of all, widows and orphans. A widow is a single word that appears on its own on the last line when your paragraph is laid out. It doesn’t look good. Do what you can to avoid widows by editing your ‘para’, up or down. An orphan is when the single word at the end of your para is stranded on its own at the beginning of the next page. It looks worse than a widow and you should remedy it as you would remedy a widow. Secondly, use ‘white space’ wherever you can. White space is the areas around your paras and your text. It is your friend and lets your content breathe, makes it look better, makes it more readable and increases the chances of someone reading it and acting on what you want them to act on. Use white space liberally, more is definitely more here. Thirdly, typefaces, otherwise known as fonts. There are hundreds of different typefaces, but two ‘families’ of typefaces. One is called ‘serif’, where the ends of the letters are pointy. It’s more traditional looking and is suited to long form content like documents, newspapers, magazines, brochures and books. The other is called ‘sans serif’ and being without the pointy bits is more blocky, modern-looking and better suited to headings and short form content. You’re reading sans serif right now. It works nicely to have some variety and use both types in your longer documents, typically with the headings a particular sans serif and the body of content a particular serif. Fourthly, be ruthlessly consistent in your hierarchy of headings. Make sure your main headings are all the same style and size, your sub-headings are all the same style and size (but a different style and size to your main headings) and so on down to your para headings. Headings signpost your reader through your ‘doc’ and there are few things more frustrating than getting lost in a document. I realise I’m taking subjects that would fill shelves of books and reducing them to a few paras. That said, a little awareness can goes a long way, which is the purpose of this post. Caveat no.2: you will see widows in my blog posts. Blogging is an altogether more casual medium, rather like email, so don’t get too hung up on them for your less formal forms of communication.